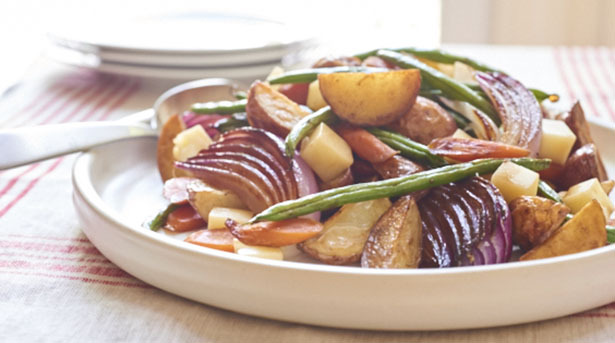 This twist on basic potato salad features roasted potatoes, carrots, and green beans tossed with balsamic vinegar and cheese strips. Cut potatoes into quarters; toss with 1 tablespoon oil. Place on 15-x10-inch baking pan. Bake 15 minutes. Toss green beans, carrots and onion with remaining 1 tablespoon oil. Add to baking pan; stir. Continue baking 15 minutes or until vegetables are tender. Combine vinegar, 2 tablespoons water, salt and pepper in medium bowl. Add vegetable mixture; toss well. Cool to room temperature. Add cheese; toss to combine. Serve at room temperature or chilled.